Welcome to my research website. Most of my contributions are made in the form of publications in journals, books or conference proceedings. Please visit the publication page to see the full list of publications (all downloadable). You can also visit my Research pages where I summarize my research lines. Ocasionally, I write posts with some ideas, material, or to announce some publication or changes in my academic life. See below. And welcome. Many people ask what is this project called “Decidim” to which I have devoted my last two year of work with complete dedication. I wanted to share a brief summary here. This text is the introduction of the Decidim’s White Paper (I am writing with Antonio Calleja and Arnau Monterde), to be published soon. I have systematized this text myself but it is really the product of a big group of people that have contributed to this project since its inception (Arnau Monerde, Andrés Lucena, Antonio Calleja, Carol Romero, Pablo Aragón and many others). Decidim [http://decidim.org], from the Catalan “let’s decide” or “we decide”, is a digital infrastructure for participatory democracy, a digital platform, built entirely and collaboratively as free software. More specifically, Decidim is a web environment (a framework) produced in Ruby on Rails (a programming language) that allows anybody to create and configure a website platform to be used in the form of a political network for democratic participation. The platform allows any organization (local city council, association, university, NGO, neighbourhood or cooperative) to create mass processes for strategic planning, participatory budgeting, collaborative design for regulations, urban spaces and election processes. It also makes possible to connect traditional in-person democratic meetings (assemblies, council meetings, etc.) with the digital world: sending meeting invites, managing registrations, facilitating the publication of minutes, etc. In addition, Decidim enables the structuring of government bodies or assemblies (councils, boards, working groups), the convening of consultations, referendums or channelling citizen or member initiatives to trigger different decision making processes. Yet, the Decidim project is much more than that. Decidim is a public-common’s, free and open, digital infrastructure for participatory democracy. It is convenient to explain the terms of this definition in inverse order. By “participatory democracy” we mean that form of “government of the people and by the people” in which people take part as equals or peers (from latin pars, part, and capere, to take). By taking part we mean that people take the part of sovereignty of political life that belongs to them. And this should be an equal part for each, democracy is something that is done among peers. The term “digital infrastructure” makes reference to a set of tools, resources, data-sets, documents, codes (legal, computer, etc. ), interfaces and services that are digitalized or made accessible by digital means. This infrastructure is primarily a software platform for participatory democracy. Participants can create proposal, sign and support them, comment, receive notifications, attend public meetings or receive the minutes. Administrators can design participatory processes, define organs, configure types of initiatives or set up consultations. The infrastructure also includes documentation, design (icons, images, logos, etc. ), legal documents, datasets or training resources, among others. All these, when organized as an infrastructure, make possible to deploy a participatory democratic system in any organization (be it a municipality, a cooperative, an association, a union or a community). By “free and open” we mean that the project’s goods (the assets of the infrastructure) do no fall under the form of private property, that excludes others from access, usage, copy, modify and re-publish or reuse these resources but, instead, displays all the legal, technical and social means necessary to share them and open them to collaboration. Finally, the term “public-common’s” indicates that the project is mostly financed and made possible by public institutions and is managed and designed by an open community constituted by public-servants, members of different associations, university researchers and students, activists and staff from foundations, workers from different companies or simply volunteers that commit to the principles of the project. For this infrastructure to be a common’s it is important that these partners organize democratically in relation to the project. In this sense Decidim is a reflexive infrastructure that uses the very infrastructure to democratize itself. Since the digital platform displays and embodies both the means of project organization and its democratic principles, it is important to explain how the platform works. Users of the platform (participants) interact through participatory mechanisms known as components within different participatory spaces that channel their democratic power to specific results. These are the frameworks that define how participation will be carried out, the channels or means through which citizens or members of an organization can process requests or coordinate proposals and make decisions. Initiatives, Processes, Assemblies and Consultations are all participatory spaces. Specific examples of each of these include: a citizen initiative for directly changing a regulation (Initiative); a general assembly or workers’ council (Assembly); a participatory budgeting, strategic planning, or electoral process (Processes); a referendum or call to vote “Yes” or “No” to change the name of an organization (Consultation). The more notable components that are combined into spaces to deliver participatory mechanisms include in-person meetings, proposals, blogs, debates, static information pages, surveys, votes, results and comments. So, for example, the various phases of a participatory budgeting process (where members of an organization are called to decide how to spend a budget) can combine components in the following way: at an early phase public meetings can be opened for citizens to analyze different needs classified by districts. In turn these meetings can lead to the design of a survey. The survey results can next be used to define a set of categories for projects to be proposed. The proposal component might then be activated for participants to create and publish their projects as solutions to the identified needs. These proposals can be commented and after two weeks of deliberation the voting component can be activated to select among the projects with a budget-expenditure system. Participants can then be called to a public meeting to evaluate the results and an assessment survey can then be launched for those who could not attend the meeting. Finally, the accountability component can be activated to monitor the degree of execution of the selected projects and people can comment on it. This is but one example of how components are combined in a space, but there are many other combinatorial possibilities. What makes Decidim particularly powerful is this combination of components within spaces, which provides an organization with a complete toolkit to easily design and deploy a democratic system adapted to its needs. All members and partners of the Decidim project must endorse and follow a “social contract” (https://decidim.org/contract) that defines a set of guiding principles. The social contract can be summarized as follows: 1. Free software and open content: Decidim will always remain free and open to collaboration, without legal or technical obstacles for the use, copy and modification. To ensure this we use a set of licenses: Affero GPLv3 for the code, CreativeCommons By-SA for the content (text, images, design, etc.) and Open Access Database License for data. This means that Decidim will always remain auditable, collaborable, transparent, appropriable and trustworthy, all of which is fundamental for a democratic infrastructure. 2. Transparency, traceability and integrity: the content of participation will always remain transparent, traceable and integral. This means that all the content must be accessible and downloadable, it should always be known what happens with each proposal, its origin, in which result or decision is was incorporated or why it was rejected or left behind, and the content needs to be displayed without been manipulated, any modification (if required) must be registered and be accessible and auditable. 3. Equal opportunities: “The platform will offer equal starting opportunities to all participatory objects (proposals, debates, etc.) for them to be viewed, discussed, commented, evaluated or treated without discrimination of any kind” (direct quote from the contract). 4. Privacy with verification: participants must retain privacy of their personal data combined with verification. Personal data should never be displayed, nor sold or transferred to third parties while, at the same time, the unicity and democratic rights of participants must be preserved (meaning there cannot be two verified users corresponding to the same individual with democratic rights and all participants with such rights must be verifiable). 5. Democratic quality and guarantees: the platform must guarantee the democratic quality, the non-discrimination and equal opportunities for each participant and proposal. 6. Inclusiveness and multilayerness: the platform must comply with accessibility standards, its use must favour the integration of online and offline participation and organizations must deploy the means for mediation and training of participants. The best known and intensively used instance of Decidim, as a digital platform for participatory democracy, is www.decidim.barcelona, with (as of March the 1st) more than 28,000 registered participants, 1,288,999 page views, 290,520 visitors, 19 participatory processes, 821 public meetings channeled through the platform and 12,173 proposals, out of which over 8,923 have already become public policies grouped into 5,339 results whose execution level can be monitored by citizens. The instance that actively explores more functionalities is meta.decidim.org, the community portal that designs and supports the project. There is also a demo site with the latest version available for exploration and a training instance open to anybody to learn how to configure, administrate and use the platform. There are currently more than 20 instances of Decidim for organizations of different sorts ranging from municipalities such as Helsinki or Pamplona, to regional governments like the Junta de Castilla la Mancha or the Generalitat de Catalunya, NGO networks such as Fundaction or QuorumGlobal, cooperatives like Somenergia, or the National Commission for Public Debate (Commission Nationale du Débat Public) in France. Developed at Barcelona’s Laboratory for Democratic Innovation, Decidim is the result of the joint effort of a network of collaborating entities and multiple participants leaded by Barcelona’s City Council. Appart from the organizations that use the platform and whose participants and administrators report bugs and suggest improvements, there is a network of 17 different collaborating entities, from software companies to institutional consortia, from research institutions to civil associations. The meta.decidim community uses an instance of the Decidim platform to organize the different dimensions of the project. As of April the 21st it has over 300 registered users, it hosts minutes of over 112 public meetings, details of 8 assemblies or working groups, 4 participatory processes (welcome process, bug reporting, feature proposals, and training workshop process) together with various initiatives and a consultations aimed at defining the roadmap and software design of the platform, bug reporting, community and project governance, research and development. Official documentation and code are developed on Github (https://github.com/decidim) where the project hosts 21 repositories with over 41 developers’ contributions. They all together generate a sustainable ecosystem that governs, produces and provides services over the platform (deployment, adaptation, configuration, training, consultancy, administration, etc.). Decidim was born in an institutional environment (that of Barcelona City Council), directly aiming at improving and enhancing the political and administrative impact of participatory democracy in the state (municipalities, local governments, etc.). But it also aims at empowering social processes as a platform for massive social coordination for collective action independently of public administrations. Anybody can copy, modify and install Decidim for its own needs, so Decidim is by no means reduced to public institutions. There are different ways in which participatory democracy infrastructures can boost social, economic and political self-organization. Decidim is starting to be used for these purposes: for the internal organization of consumer and producer cooperatives for example, it is also helping youth movements organize and design strategic planning, and it might soon be used to coordinate massive strikes or other forms of social action. The modular nature of the software architecture is also making possible for these organization to develop their own components and improvements (such as crowdfunding, membership management, etc.) and to plug them into Decidim, expanding its potential. Corporate digital platforms (Amazon, AirBnB, etc.) are disrupting private services and markets. Decidim comes to fill the gap of public and common’s platforms, providing an alternative to the way in which private platforms coordinate social action (mostly with profit-driven, data extraction and market oriented goals). As we have repeatedly stressed, Decidim is more than a technological platform. It has required to assemble a variety of codes, realities and dimensions that go beyond programming code. We define it as a “technopolitical project” where legal, political, institutional, practical, social, educational, communicative, economic and epistemic codes merge together. Ultimately, Decidim is in itself a sort of crossroad of the various dimensions of networked democracy and society, a detailed practical map of their complexities and conflicts. We distinguish three general planes or dimensions of the project: the political (focused on the democratic model that Decidim promotes and its impact on public policies and organizations), the technopolitical (focused on how the platform is designed, the mechanisms it embodies, and the way in which it is itself democratically designed), and the technical (focused on the conditions of production, operation and success of the project: the factory, collaborative mechanisms, licenses, etc.). The political plane is best illustrated by the use of Decidim in a city or organization, the type of democratic processes and decisions that are made through it. In other words, it covers what kind of politics can be done using Decidim: what kind of governance, conflict and power relationships can be channeled through it: the kind of democracy it is capable to produce. Its model instance is decidim.barcelona, what happens within, how it alters the political space of the city. The second plane, the technopolitical, includes matters concerning the digital architectural design of Decidim: its interfaces, features, design principles, data policies, user experience, etc. It is a primarily a reflexive space of how technologies structure political processes. It is embodied in the meta.decidim platform and the community that surrounds it. Finally, the technical plane encompasses issues concerning primarily the programming and legal codes (information and legal infrastructures), but is also includes issues of education and knowledge (epistemic infrastructures). All three dimensions are part of the project. Table 1: Systematization of various aspects of the Decidim project in the political, technopolitical and technical planes with the city of Barcelona as a reference. I am glad to post that Miguel Aguilera presented his PhD thesis and is now officially a doctor in cognitive science by the University of Zaragoza. His thesis “Interaction Dynamics and Autonomy in Cognitive Systems” is a rare, challenging, broad, audacious and brilliant contribution to the study of autonomous systems. How does a “self” or an “autonomous system” emerge and constitute itself through interactions with the environment? It seems the answer is impossible to provide, you need to have a self, an identity, before it starts interacting with the environment, but, at the same time, some forms of sensorimotor or cognitive identity emerge and sustain themselves through interactions. You are an example yourself: your identity is the result of your actions, and your actions are caused by you. How could this be? Can we formalize and model this type of emergence of autonomous organizations through interactions? This is the fundamental question addressed by Dr. Aguilera. And the results are innovative, profound, operational and insightful. The core of the thesis is a robotic model capable to switch spontaneously between different behavioural preferences, and whose control architecture is itself a novel contribution to robotics: a kuramoto oscillatory network whose connections plastically change so as to keep macroscopic relationships homeostatic. The robot is a system that is capable to maintain its own behavioural organization while shifting preferences. Nothing is hard-coded, the controller is designed using a carefully scaffolded evolutionary optimization algorithm that gave rise to a complex dynamical system that shows macroscopic properties that emerge from distributed interactive processes at different timescales. But this is not the major contribution of the thesis. I have finished the last revision of journal paper entitle “Autonomy and Enactivism“. It explores the conceptual tension between the concept of autonomy (self-organized closure of neural activity) and the sensorimotor constitution of cognition. I have long witnesses a generalized confusion, whose roots I explore in the paper, between two major schools of enactivism (the cognitive science paradigm that focuses on sensorimotor coupling and self-organized dynamics of brain, body and environment). On the one hand what I have called “sensorimotor enactivism”, a school that has gained momentum thanks to the work of Alva Noë and Kevin O’Regan on sensorimotor contingencies. On the other hand what I have called “autonomist enactivism” with a particular focus on biological embodiment and the self-organized nature of brain and body. The gap between both schools has being growing recently, partly motivated by the lack of a clear notion of sensorimotorly constituted neurodynamic autonomy. Building upon the work I have been doing with my colleagues (Di Paolo, Buhrman, Santos, Aguilera and Bedia) during the last years I hope to have contributed to the compatibility and mutual reinforcement between both schools of thought. It is a long paper, and the contribution does not limit to a historical or contingent dispute between schools of thought: the reconciliation demands to develope a theory of sensorimotor autonomous agency and touches upon foundational aspects of cognitive science, from the emergence of norms to the epistemology of mechanistic explanations. We just published a beautiful paper trying to understand the structure and dynamics of the 15M communication networks and they way in which they give rise to forms of collective identity. Network analysis of the multitudinous collective identity of the 15M network (green) compared to traditional labour unions (in red). Click on the picture to enlarge. Abstract: The emergence of network-movements since 2011 has opened the debate around the way in which social media and networked practices make possible innovative forms of collective identity. We briefly review the literature on social movements and “collective identity”, and show the tension between different positions stressing either organization or culture, the personal or the collective, aggregative or networking logics. We argue that the 15M (indignados) network-movement in Spain demands conceptual and methodological innovations. Its rapid emergence, endurance, diversity, multifaceted development and adaptive capacity, posit numerous theoretical and methodological challenges. 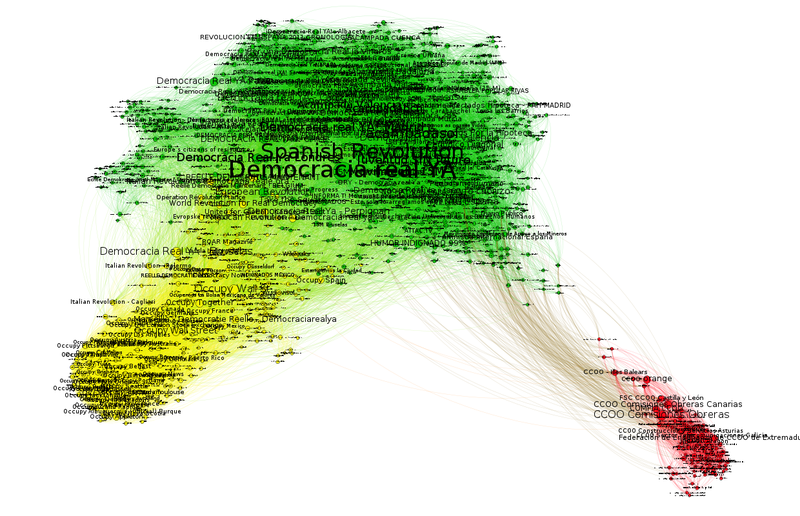 We show how the use of structural and dynamic analysis of interaction networks (in combination with qualitative data) is a valuable tool to track the shape and change of what we term the “systemic dimension” of collective identities in network-movements. In particular, we introduce a novel method for synchrony detection in Facebook activity to identify the distributed, yet integrated, coordinated activity behind collective identities. Applying this analytical strategy to the 15M movement, we show how it displays a specific form of systemic collective identity we call “multitudinous identity”, characterized by social transversality and internal heterogeneity, as well as a transient and distributed leadership driven by action initiatives. Our approach attends to the role of distributed interaction and transient leadership at a mesoscale level of organizational dynamics, which may contribute to contemporary discussions of collective identity in network-movements. Comienza el curso y en muchos ámbitos laborales, sociales, institucionales y académicos hay que desarrollar proyectos, planificar, decidir sobre cómo vamos a organizarnos, calendarizar, ajustar presupuestos, fijar objetivos, en definitiva planificar. El mundo de la planificación es complejísimo, está lleno de opciones, diferentes filosofías y multitud de herramientas. Aquí repasamos algunas de ellas. 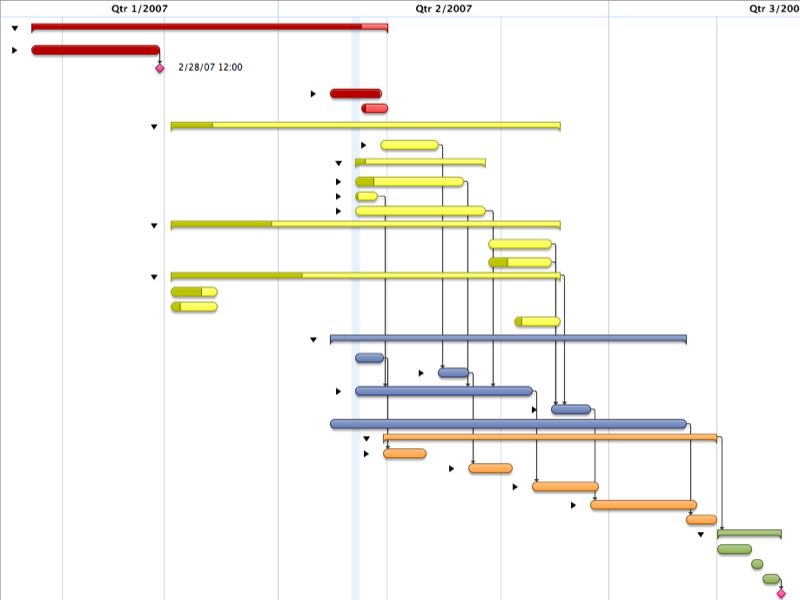 Nos hemos centrado en las herramientas y filosofías de la planificación y gestión de proyectos que vienen del mundo del software libre por dos motivos: a) porque la complejidad de los procesos de desarrollo de software es suficientemente grande como para que los métodos sean útiles en casi cualquier otro ámbito de organización de procesos y b) porque es en el mundo del software libre donde encontramos el mayor ejemplo de gestión colaborativa y abierta (frente a las herramientas de gestión y planificación de proyectos del mundo empresarial o institucional más clásicos). Hoy mismo se presenta (por fin!) 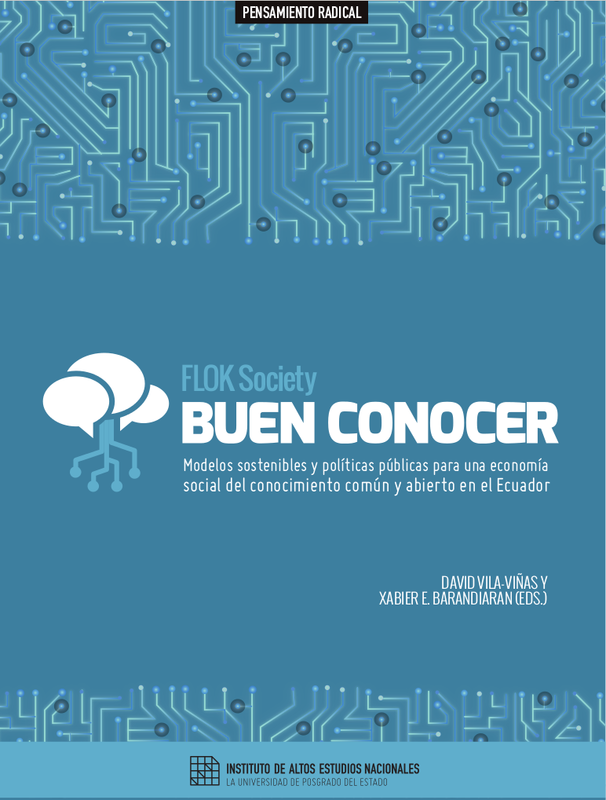 el libro que recoge gran parte de los resultados del proyecto Buen Conocer / FLOK Society en el que he estado involucrado desde sus orígines, hace ahora dos años. El equipo de aLabs ha realizado un excelente trabajo con la página web del libro. Como asesor de la edición digital me siento, por primera vez, ante una web que hace justicia al contenido y a la forma en que un libro debe insertarse en el ciberespacio: con copyleft, con una estructura clara, con la posibilidad de descargar los capítulos por separado, con varios formatos abiertos disponibles (html, PDF, ePub, ODT), con metadatos que permiten automáticamente clasificar los contenidos en gestores bibliográficos y facilitar la busqueda, y, no menos importante, con una estética funcional, clara y atractiva. Pero lo que realmente merece la atención es el contenido del libro. Son un total de unas 800 páginas (dependiendo de la edición), agrupadas en 12 documentos de políticas públicas y diseño de modelos sostenibles de producción y consumo orientados a construir alternativas viables y democráticas fuera del modelo del capitalismo cognitivo, fuera del formato de la propiedad intelectual, orientados siempre hacia la exploración de la potencia del conocimiento libre, común y abierto, como verdadero motor de una economía social. Todo un reto que ha requerido la colaboración de cientos de personas.